Archaeological excavation of the Spanish Colonial fort of El Presidio de San Francisco started in early May 2014. They revealed archaeological deposits with artifacts and features dating to the Spanish, Mexican, and American occupations of the area. It is the biggest public site of its kind west of the Mississippi. Our open site approach allows visitors to talk directly to archaeologists and ask questions as they witness excavation first hand. Docents are available to give overviews on the history of the Presidio. They answer general questions about archaeology and the goals of the excavation. 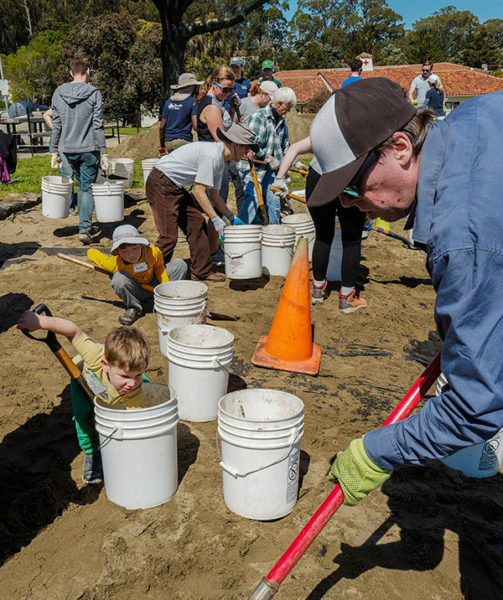 At the Presidio Archaeology Lab, much of our work relies on the help and dedication of our volunteer community. The volunteer program was conceived well before the El Presidio de San Francisco excavations began. We currently have a pool of 225 volunteers who have undertaken training in the proper handling and processing of artifacts and lab techniques. This group helps us in the lab throughout the field season. They participate in a variety of tasks both indoors and out. Our mailing list now exceeds 500 interested individuals, and we get more sign ups every day. As our volunteer program has grown, we’ve continued to seek opportunities to create a program that is not only beneficial to our lab and the work that we do, but also supports and encourages the interests and hard work of our volunteers. Each year, we hold two bookend events. The first, Back into the Earth Day, signifies our return to the earth and the launch of the season by exposing our units from the previous years. International Archaeology Day is our end-of-season open house. We invite the public to see all aspects of our work and what we discovered during the field season. Back into the Earth Day is a day to reconnect with our docents and volunteer community after a winter hiatus and is a fun hands-on way to introduce archaeology to the curious public. The Presidio Archaeology Lab is dedicated to public archaeology and tries to offer multiple opportunities for park visitors to be exposed to archaeology and its significance. Back into the Earth Day is the one day each year that we invite the general public to step into our units for a day and “dig” alongside us. 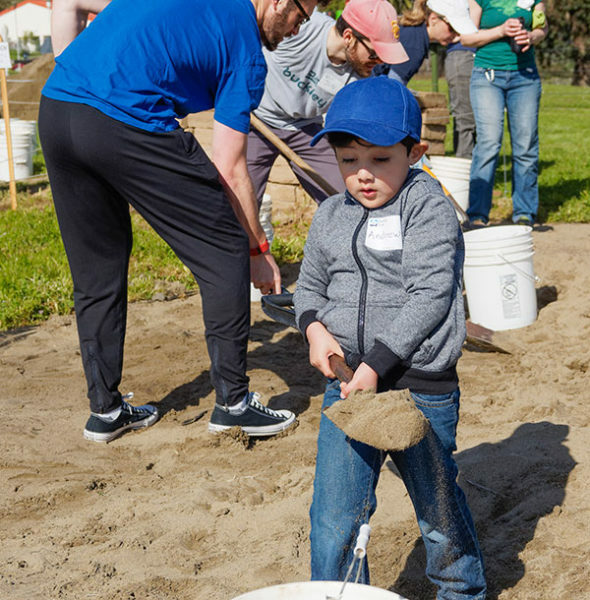 On Earth Day 2018, Saturday, April 21st, volunteers ranging from the young to the not-so-young helped us to remove the sand fill used to protect the archaeological site during the offseason. A total of 162 volunteers made short work of the majority of the sand. 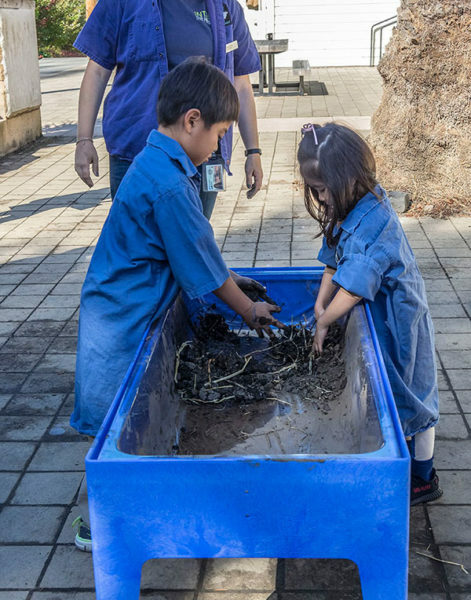 Volunteers alternated between shoveling sand and emptying buckets – quite a task! Throughout the day we had curious onlookers step onto the site to ask questions and take pictures. Quite a few even decided to join the fun! The day finished with a BBQ and socializing at the outdoor lab area situated only a short walk from the site. At the end of the season, in October, we hold our second bookend celebration that is coordinated with other International Archaeology Day events throughout the world. We open our lab and collections facility, in addition to the site, encouraging the public to get a behind the scenes look at what we do. This event is youth-oriented, with educational games, puzzles, scavenger hunts, adobe brick making, and many more activities. International Archaeology Day is also a reunion of sorts, with many former volunteers, interns, and team members returning to reconnect with each other before the site is closed for the winter. The 2017 event saw us welcome over 300 visitors of all ages, and we expect even more this year! After our celebrations, the site is again covered in landscaping fabric and backfilled with locally-sourced sand until it is unveiled again in April for Back into the Earth Day. These events are incredibly popular and are great ways to acknowledge our volunteers, but we are constantly on the lookout for ways to improve our program and to honor our volunteers throughout the year. Throughout the season, volunteers help wet screen in the outdoor lab and sort and process artifacts in the indoor lab. Over the years, with a combination of surveys, individual suggestions, and in-person conversations, we have been able to craft a program that is not only beneficial to the lab, but also cultivates a feeling of ownership and agency for our volunteers. Based on this ongoing feedback, we are able to create special programs and engaging events that often reach a wide range of age groups and communities. These programs and our research excavation would not be possible without our community of volunteers and docents. One such suggestion from volunteers resulted in after hours workshops geared towards learning the finer details of archaeology and research. These workshops will cover ceramic types, zooarchaeology, glass identification and manufacturing techniques, and more topics still in the works. Eventually, we hope to partner with outside institutions to expand our offerings by inviting guest speakers and specialists. As we move forward, we are seeking more ways to improve or expand the program without sacrificing the quality of our offerings and overtaxing our staff. We will look towards our volunteers and listen to their ideas on what could be improved, or removed, and make the necessary adjustments. They allow us to meet our goals in interpretation, investigation, and education. So, as we embark on our fifth season, we remind ourselves that we are not only a team of archaeologists, but a community that reaches well beyond the limits of the park.